Quick scrambled eggs and bacon for a crowd came from celebrating a college graduation this weekend with an open house. We began with breakfast for first comers, had mid-day dinner and ended with afternoon snacks for the littles. All day eats! Everybody contributed a dish or two. For breakfast we had pastries, coffee cakes, yogurt parfaits and melon slices. I wanted a bit of protein to balance the meal so we invented Quick Eggs and Bacon on the fly. Although we were probably not the first to execute the concept, we had a perfect product! I took a pound of bacon, cut the slices in half so that they were about four inches long. I browned them in a skillet while sister in law Deb broke open a dozen eggs. She whisked them thoroughly then added a quarter cup of milk, salt and pepper. I sprayed the cups in two muffin tins with cooking spray. When the bacon was starting to brown and turn crisp, we tried crisscrossing the pieces in the bottom of muffin cups. Too hot to handle! And it didn’t leave much room for eggs. I ended up dropping a bacon slice half in each cup with tongs. Deb followed up with the egg mixture, poured over and around the bacon slice until each muffin cup was about half full. The oven was already preheated to 350 from baking a dinner dish. We popped the filled muffin tins in for ten minutes. Congratulations to one very happy college graduate and her very proud Dad and Deb! 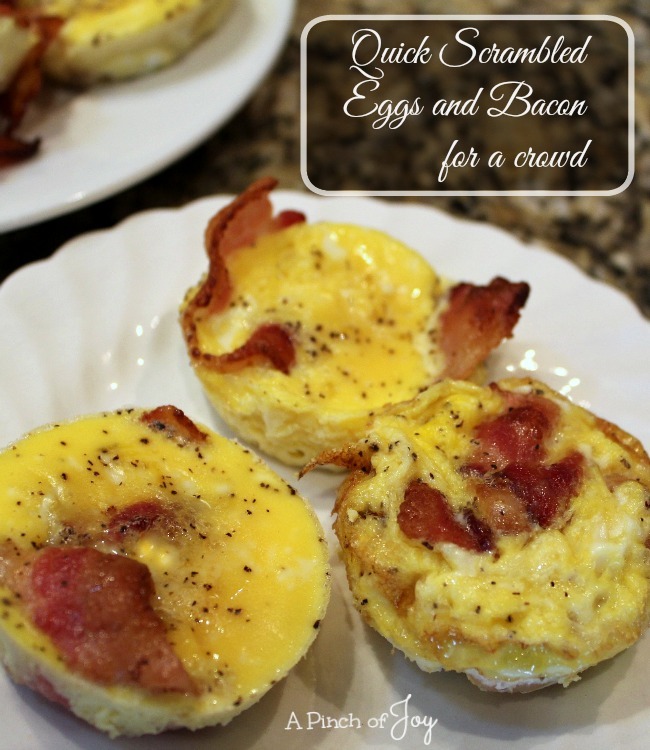 Perfect little omelets, light, fluffy and tender eggs, with crispy bacon in the middle. Preheat oven to 350. Spray two muffin tins with cooking spray. Slice bacon in half so pieces are about four inches long. Place in skillet and cook over medium heat until bacon begins to brown and to crisp on the edge. In meantime, break eggs in large bowl and whisk thoroughly. Add milk, salt and pepper. When bacon is done, drop one slice in each of the twenty four muffin cups. Fill each muffin cup about half full with the egg mixture, pouring the eggs over and around the bacon slice. Slide dinner knife around egg to ease removal from pan. Arrange on platter and serve immediately.